For one thing, it is still SO HOT around here. I think I complain about the heat every year until November, so I should be used to this by now. Yesterday, it stayed a warm 92 in the house until the AC cycled back on at 8 PM. I'm not sure how saving some electricity is worth me sweating to death, but oh well. I remember swimming at my parents' house over the weekend thinking that this could be *it* for swimming this year, but maybe summer just isn't over yet. Also, while I'm not a fan of the whole pumpkin spice latte thing (Gingerbread is more of my taste), I did indulge on the first day it became available after a particularly fragmented night's sleep. And... it was not good. Pumpkin spice muffin the next day... not good. I'm pretty sure I'm over my pumpkin obsession?? I've hit a slump and am not excited about working out these days, maybe because of fatigue. I keep eyeing a half-marathon in December, but I can't bring myself to pull the trigger because I don't know if time or energy is in the cards... and paying X dollars against those chances sound terrible. On another note, I used this cool aggregate website, ShoeKicker, to finally get a new pair of running shoes, the Saucony Stabil CS3. The last record I have of getting new "distance" shoes on here was in 2011, though I checked my Amazon records, and my last purchase was actually in 2012. Still, 3 years is a long time between shoes, so long that there is a new model from the CS2. 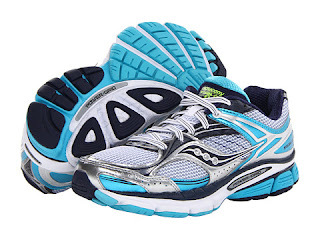 I wore these to literally run to the drug store, and I felt like I was running on CLOUDS. And since it was close to mid-day and I was squeezing in an errand/exercise as possible, I think I pretty much felt like I was running too close to the sun a few times... but at least my feet and legs were supported. 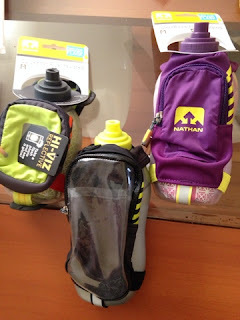 Nathan Sports recently sent over some handheld running water bottles that probably would have helped had I not already had my hands full of my phone and vitamins. I am using the Quickdraw Plus (right) to carry stuff in the little pouch. The water is easily accessible, as well. The Quickview (middle) is pretty nice because you can view your phone through it. The Quickshot is good for racing when you just need a little to cover you between water stations. In my mind, though, it almost looks like dad's bottle, mom's bottle, and baby's bottle! These days, I tend to just carry a key and my phone while running, so without adding much more, I can have water, too! Other than that, I know a lot of fun times are coming soon (Halloween, the holidays, Baby Tuesday's birthday), but it's hard to get revved up because I'm so beyond exhausted and anxious about things that I probably shouldn't be. Pretty sure my outlook would be better with some more shut-eye. FTC Disclaimer: I was provided a sample of Nathan Sports handheld running bottles and was not otherwise compensated to provide a positive review.